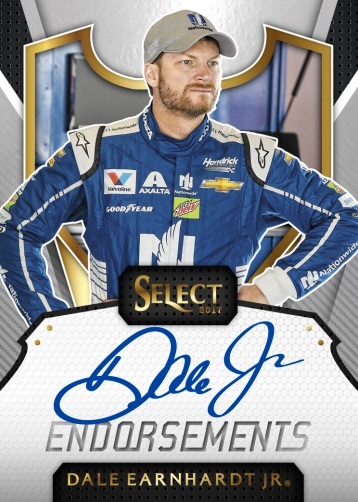 Growing the racing choices for collectors, the 2017 Panini Select NASCAR checklist takes things into overdrive with a new extension for the established card brand. In addition to four base short prints and several inserts, hobby boxes deliver five combined hits with three autographs and two relics. 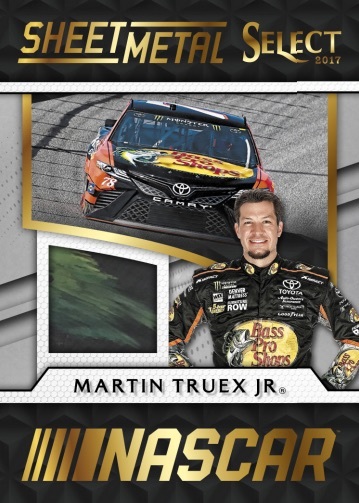 Broken into tiers, the 2017 Panini Select NASCAR base set consists of 140 cards. The first 100 cards are dubbed Grandstand and these are the most common. 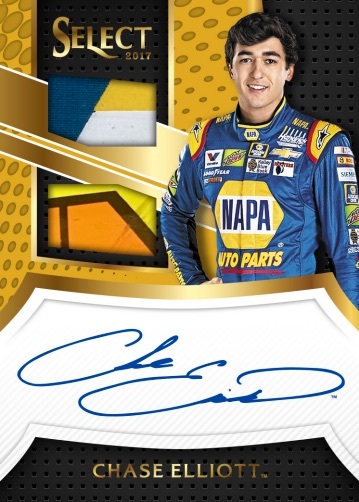 Next is Pit Pass which averages 1:4 packs and covers cards #101-130. Finally, the most rare cards in the base set are found in the box-hit Hot Pass subset (1:12 packs). A constant in Select products, base Prizms bring more to the equation with nine parallel versions in the rainbow, including eight that are numbered to 299 or less. 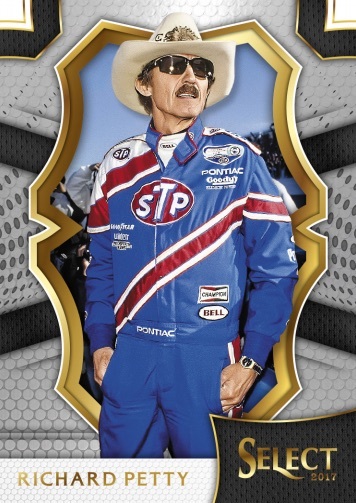 Race-themed inserts up the ante in Select NASCAR with choices such as Select Stars (1:12 packs), Speed Merchants (1:4 packs) and Up Close and Personal (1:6 packs). 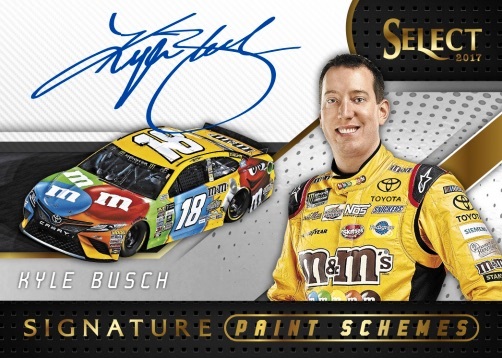 Boasting multiple autographs that combine to average two per 2017 Panini Select NASCAR box, Endorsements and new Signature Paint Schemes offers hard-signed cards for top drivers. Limited parallels for both come as Blue Prizm (#/199 or less), Red Prizm (#/99 or less), Gold Prizm (#/10 or less) and Checkered Flag Prizm (1/1) versions. Providing race-used relics in addition to an on-card autograph, Signature Swatches is issued in Single, Dual and Triple memorabilia sets. Parallels shift slightly with White Prizm (#/50 or less), Tie-Dye Prizm (#/24 or less), Gold Prizm (#/10 or less) and Checkered Flag Prizm (1/1). Filling the rest of the hit quota for 2017 Panini Select NASCAR, memorabilia cards average three per box. 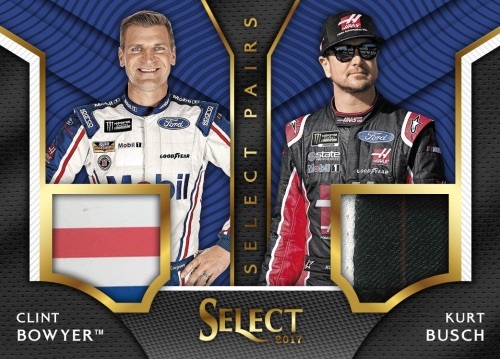 Sheet Metal only uses race-used material while Select Pairs provides race-used swatches for two drivers on the same card. Once again, Blue Prizm (#/199 or less), Red Prizm (#/99 or less), Gold Prizm (#/10 or less) and Checkered Flag Prizm (1/1) parallels increase the totals. GRANDSTAND PRIZM PARALLELS: Silver, Purple Pulsar, Red/White/Blue Pulsar #/299, Blue #/199, Red #/99, White #/50, Tie-Dye #/24, Gold #/10, Black #/3, Checkered Flag 1/1. PIT PASS/HOT PASS PRIZM PARALLELS: White #/50, Tie-Dye #/24, Gold #/10, Black #/3, Checkered Flag 1/1. PRIZM PARALLEL CARDS: Blue #/199 or less, Red #/99 or less, Gold #/10 or less, Checkered Flag 1/1. 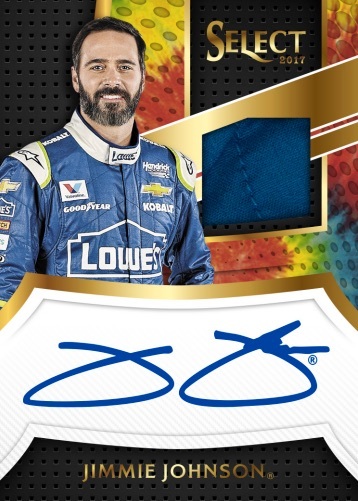 *Jimmie Johnson only in parallels. View specific parallel numbering with the full spreadsheet. PRIZM PARALLEL CARDS: Blue #/199 or less, Red #/99 or less, Gold #/10, Checkered Flag 1/1. PRIZM PARALLEL CARDS: White #/50, Tie-Dye #/24, Gold #/10, Black #/3, Checkered Flag 1/1. PRIZM PARALLEL CARDS: Blue #/199 or less, Red #/99 or less, Gold #/10 (Jones - #/6*), Checkered Flag 1/1. PRIZM PARALLEL CARDS: Blue #/199 or less, Red #/99 or #/25*, Gold #/10, Checkered Flag 1/1. PRIZM PARALLEL CARDS: Blue #/50 or less, Red #/25 or less, Gold #/10 or less, Checkered Flag 1/1. PRIZM PARALLEL CARDS: White #/50 or less, Tie-Dye #/24 or less, Gold #/10 or #/5, Checkered Flag 1/1. *Mark Martin, Case Mears found only in parallels. PRIZM PARALLEL CARDS: White #/50 or less, Tie-Dye #/24, Gold #/10, Checkered Flag 1/1. 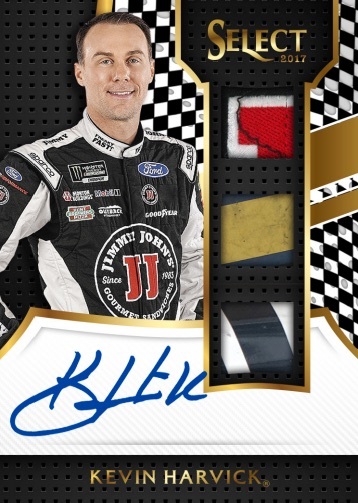 I’m pumped for this set, panini has been doing a great job with their NASCAR products, especially Torque. Can’t wait to see the checklist. Opened 2 boxes today – each had a tie-dye base (Danica and McMurray) and one of the boxes had 2 #/10 Gold autos. Much better break than say Certified was last year by far…. 2017 PANINI SELECT RACING HOBBY BOX - LOOK FOR 2 AUTOS & 3 MEMS PER BOX!